$195 pp includes lunch on first day. Does Antonio Gaudi, Niki St. Phalle or Isaiah Zagar inspire you? Do you have old chipped dishes that are sentimental but need to be re-purposed? 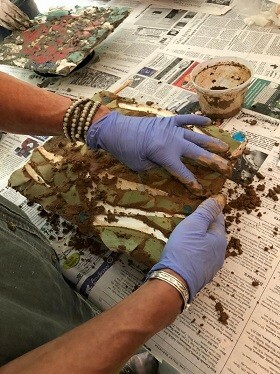 Hands-on ceramic shard mosaic workshop. 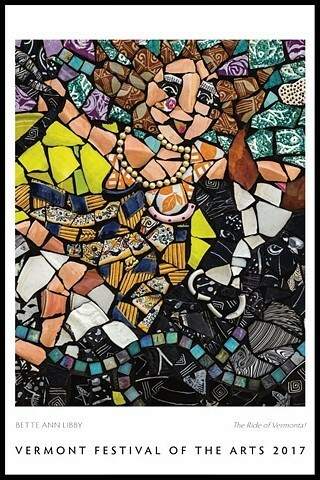 Incorporate ceramic shards and mirror into engaging mosaics. Transform and recycle your own materials and learn the fundamentals of shaping, cementing and grouting. One and a half days. To see photos of recent workshops, go to the Mosaic Workshop tab on my web home page. For more information, contact Libby, or call (617) 327-5171. Reserve by check to 20 Walnut Hill Road, Chestnut Hill, MA 02467. 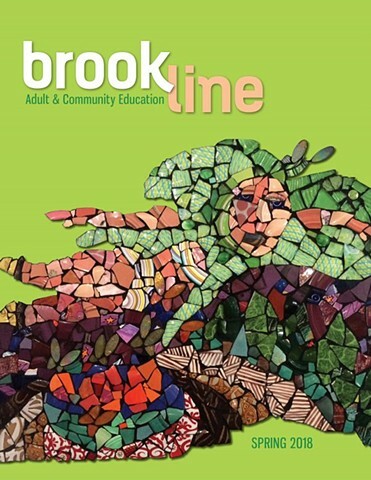 Bette Ann Libby was selected as the artist to provide the cover art for the four Brookline Adult & Community Education Catalogues for 2017-18. Bette Ann Libby's "The Ride of Vermonta" was chosen to be the image used for the 2017 Vermont Festival of the Arts. "KLEE VILLAGE SPRING & WINTER"
Come visit the permanent installation of the Brookline Town-wide Mosaic at the Brookline Coolidge Corner Library. The 12 color accented mosaic panels were made with ceramic shards donated from Brookline homes and with the participation of numerous town residents. Made possible by the Friends of the Brookline Public Library. Special thanks goes to Catherine Dooley, Coolidge Corner Librarian.